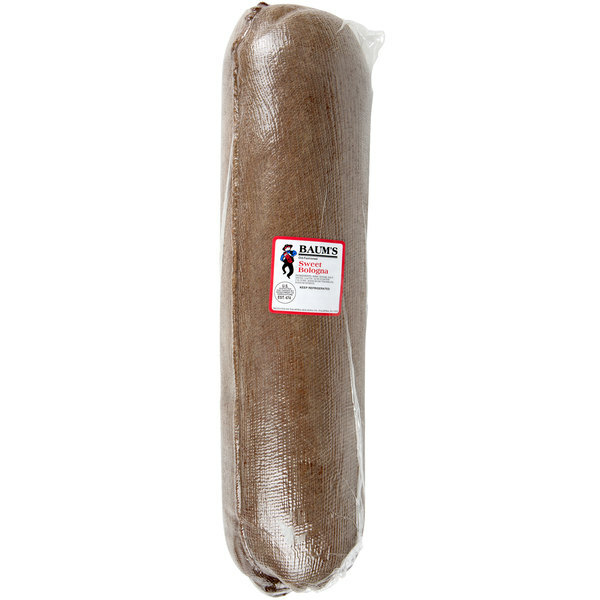 Add a classic deli meat to your kitchen with this Baum's 9 lb. sweet whole stick bologna. 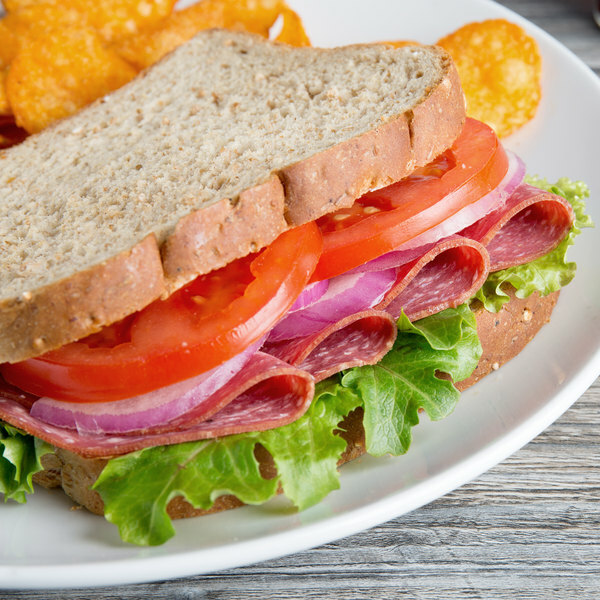 Made of 95% lean beef meat and Baum's own spice blend to provide a high-quality product, this bologna is perfect for your deli, grocery store, or sandwich shop. Sweet bologna adds a flavorful bite to sandwiches with its smooth texture and distinct tangy taste. 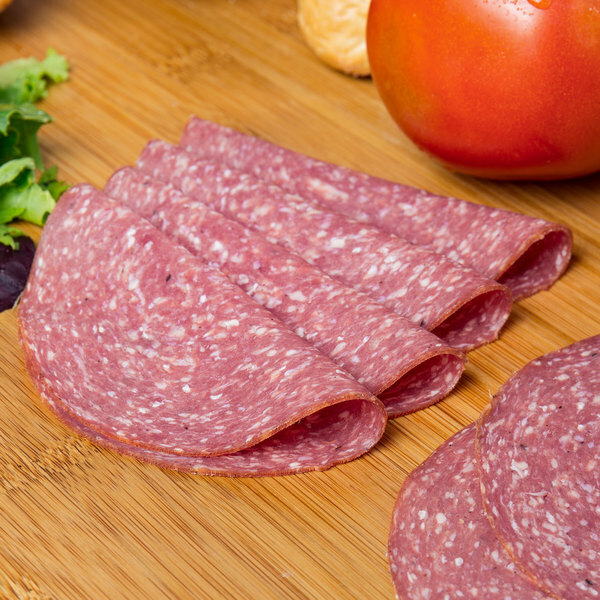 Similar to salami, bologna is darker in color. It's cured, smoked, and fermented to bring together the natural flavors of the beef for a quality cold cut. Packed as a whole piece, this classic deli meat is perfect for slicing to the desired thickness for use on sandwiches or chef salads. Cut it into bite-sized pieces and serve with a side of sweet or spicy mustard for a savory-sweet snack. It's also perfect for pairing with aged cheeses and fresh fruits on charcuterie boards. For an easy appetizer, roll slices of this sweet bologna with fresh arugula, juicy tomato slices, and a light spread of mayonnaise or cream cheese for a savory wrap your guests will love. The fresh flavors combined with the smoky taste of the bologna create a one-of-a-kind combination. Based in the rolling hills of Pennsylvania Dutch country, Seltzer's Lebanon Bologna is the leading producer of the regional bologna specialty. Seltzer's Lebanon Bologna partnered with the Baum family to combine a unique family recipe with the use of traditional smokehouses to create a quality product. One of the secrets to their success is their old-fashioned process of smoking their bologna over hand-tended fires. Quality control over both the ingredients and the smoking process is a priority at Seltzer's Lebanon Bologna, and they pride themselves in being one of the oldest USDA-inspected operations in the country. Bring the tradition of Seltzer's Lebanon Bologna to your business to add a classic, delicious product your customers are sure to love.